I have been working on developing a good vegan rice pudding recipe for a while now. Riz bi haleeb, a Middle Eastern rice pudding flavored with orange blossom and sometimes rose water, has a distinct consistency slightly different than a classic custard-like pudding. It is lighter, with an almost gelatinous consistency, but extremely creamy and smooth. After a few tries, I am delighted to share my vegan version with you. It evokes the same childhood memories that my mom’s rice pudding did, whenever she would make it as a treat for special occasions. 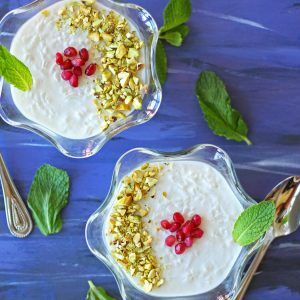 The orange blossom flavoring and crunchy pistachio topping are some of what makes this Middle Eastern rice pudding so irresistible. 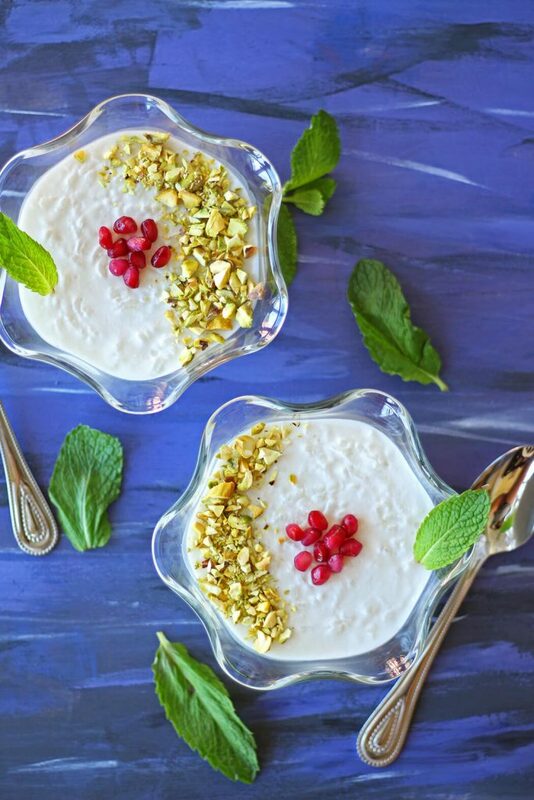 It immediately takes me back to my visits to the Middle East, where no dessert is found without crushed pistachios on top, and the fragrant aromas of rose water and orange blossom syrup linger throughout the air, as you sip your post-dinner tea. 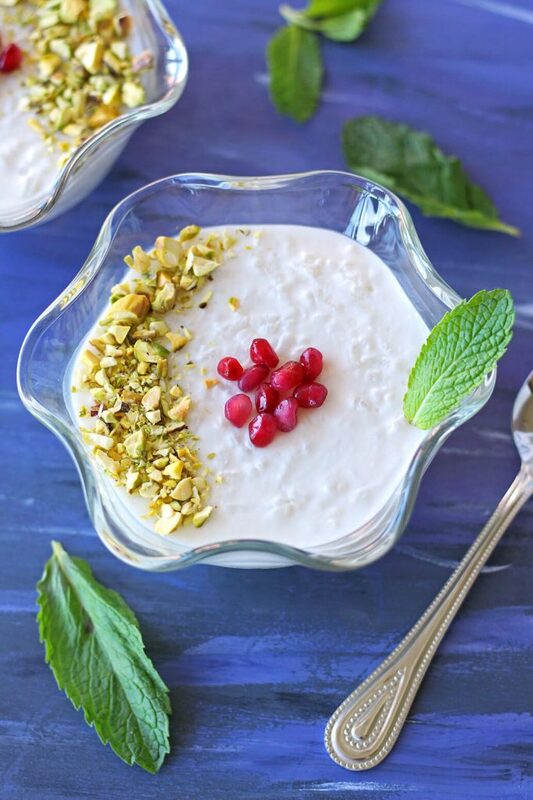 A vegan rice pudding reminiscent of the classing Middle Eastern Riz bi Haleeb, a light and creamy orange blossom rice pudding topped with pistachio. Rinse and drain the rice. Place the rice and water in a large pot and bring to a boil. Lower heat and simmer until the rice is cooked- about 5 to 10 minutes. This will be when most of the water has been absorbed, but the rice does not stick to the bottom of the pot. Add coconut milk and sugar to the rice and return to a boil. Lower heat and simmer on low for 30-35 mins, until thickened. Meanwhile, mix the 1 cup non dairy milk, orange blossom water, and corn starch in a small bowl. Once the pudding has thickened, add the orange blossom milk mixture to it. Stir through until combined and cook for 10-12 minutes on medium low heat. You want the pudding to be a relatively uniform texture, but not to the point where all the liquid has been absorbed. The liquid should still drip, slowly, from the back of a spoon. After no more than 12 minutes, remove pudding from heat. Divide between 5-6 serving bowls and cool in refrigerator for at least 2 hours, or overnight. Top with crushed pistachio and serve! And thank you for the yummy and pretty recipe. 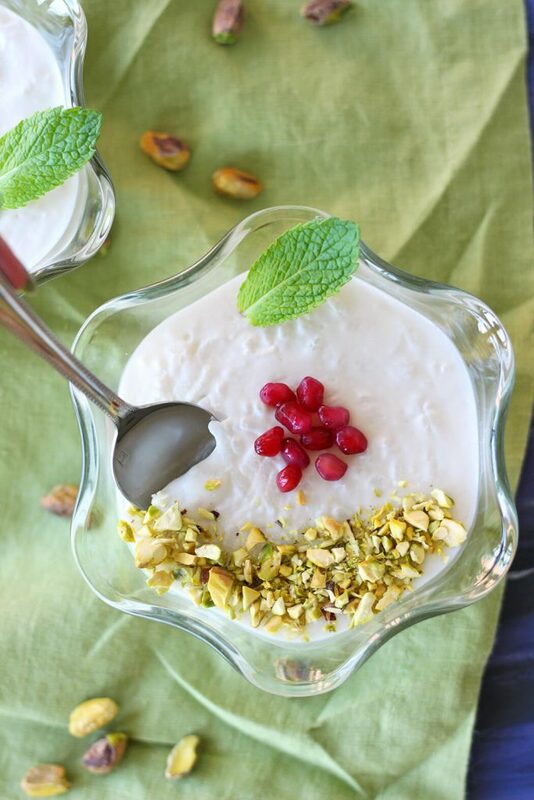 I’ve tried a version of this in Palestine where the rice or semolina (not sure anymore which one it was :D) milk pudding was covered with a clear pink rose water pudding or syrup with pomegranate seeds and topped with caramelized pistachios. It was so tasty and fragrant that I’d love to recreate it, preferably as a vegan version so my whole family can enjoy it, however, the rose water I get from Arab grocery shops isn’t that pink so I was wondering if beet juice would work as a coloring agent? The rose layer was extremely sweet and the whole thing was mixed together before eating so should I cut down the sugar in the rice pudding layer to balance it out?